Durham Bulls fans have more to look forward to than Opening Day this year. Today the Bulls, in partnership with Inter-Faith Food Shuttle (IFFS) and sponsored by Blue Cross and Blue Shield of North Carolina (Blue Cross NC), announced the Durham Bulls Victory Garden. Planted outside of the Durham Bulls Athletic Park (DBAP) on Jackie Robinson Drive, this new fruit and vegetable garden will supply fresh produce to Durham neighborhoods in need. According to the US Department of Agriculture, North Carolina is the eighth hungriest state in the country. More than 630,000 children, families, and seniors across our state aren’t sure when or where they will get their next meal. Working across a seven-county radius, IFFS builds community food systems that support all residents with knowledge, skills, and access to healthy eating. IFFS’s work includes gathering and distributing food to low-income residents. IFFS is planning to collect 1,200 pounds of organically grown food from the Victory Garden each growing season to distribute through the nonprofit’s network of pantries and mobile markets. The space will also highlight the connection between gardening and the food we eat each day. importance of a diet of healthy, fresh food. The Bulls will also lead three Bulls Kids Club garden tours each baseball season. The garden, to be designed by Apex’s Bland Landscaping Company, grew from the idea that landscapes around Durham could be used for more than decoration. The Durham Bulls, IFFS, and Blue Cross NC aim to show the community how small plots of land can be transformed into gardens. 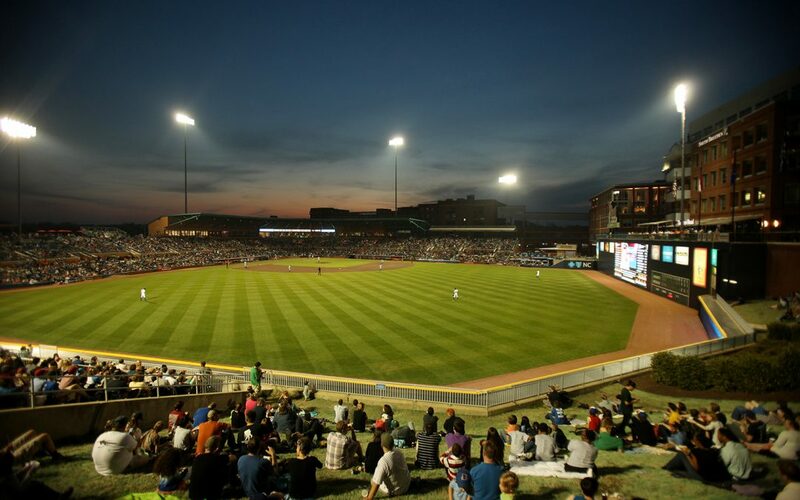 The DBAP, which sees more than 500,000 visitors each year, was the perfect downtown Durham spot to host the space. Bland Landscaping will maintain the garden throughout the year. IFFS will coordinate workshops, field trips for school children, community outreach and educational activities. IFFS will also organize volunteer opportunities to harvest and deliver food to local food pantries. Blue Cross NC’s sponsorship of the Durham Bulls Victory Garden is part of a series of charitable donations aligned with the mission of Thrive NC presented by Blue Cross NC. Blue Cross NC is donating $250,000 along with all ticket proceeds from Thrive NC to nonprofit organizations across the state. Thrive NC is a two-day event, scheduled for May 10-11 in downtown Raleigh. Thrive NC will feature a food festival with contributions from top chefs and restaurants, live music and community service. A collaborative summit will kick off the event with meaningful conversations to address food system challenges in North Carolina.